I missed Dave McClary’s BRIGSBY BEAR in its limited theatrical run last year (I’m not even sure if it came to my area), but just caught up with it on Blu ray and I’m glad I did because it’s a real delight. If you haven’t watched Saturday Night Live lately you might not know the film’s star, Kyle Mooney, but he’s a current cast member since 2013 who has made a bunch of weird, awkward but highly amusing digital shorts (inheriting the brand from Andy Samberg) like this one, and this one. Here Mooney and director McClary, who both made over 70 of those shorts, have, with the help of co-writer Kevin Costello, successfully translated their silly small screen shenanigans to the big screen with this tale of a scruffy 30-year old named James who discovers that the people he thought were his parents (Mark Hamill and Jane Adams) are actually a couple who abducted him when he was a baby, and that there’s a real world outside the underground bunker he’s been living in for all his life. What’s even crazier is that he grew up watching and obsessing over a children’s television show called “Brigsby Bear Adventures,” but it’s a program that only he has ever seen as his faux father fabricated it - writing, starring, and directing decades of episodes - at an outside studio with props, costumes, brightly colored sets, and even a young woman (Kate Lyn Sheil) he hired to play two roles who Hamill’s Ted told the show was for Canadian cable access. 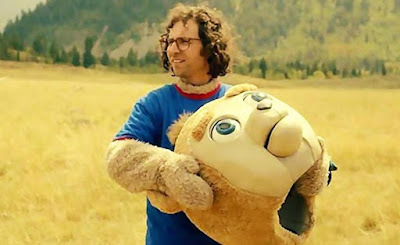 So when the bunker is raided by the FBI, and his parents are taken away, James is re-united with his real parents (Matt Walsh and Michaela Watkins), but has trouble adjusting with his family, and sets out to make a movie that concludes the Brigsby Bear series. The endearingly meek Mooney sweetly carries the movie with help from a well chosen cast including Greg Kinnear as a sympathetic police detective, Claire Danes as a family therapist, Ryan Simpkins as James’ sister, Jorge Lendeborg Jr. as a friend who helps with shooting the Brigsby Bear movie, and SNL alums Andy Samberg and Beck Bennett in brief but effective cameos. I didn’t expect that I’d like it as much as I did, but I found BRIGSBY BEAR to be a goofy yet sometimes sad charmer with a big heart. I love how it celebrates the idea that one’s obsession with something imaginary can be channeled into creating something real that’s personal yet can be shared with many others.